Product #21192 | SKU 876955 | 0.0 (no ratings yet) Thanks for your rating! Extend the reach of your telephoto lens with this APO Teleconverter 2x EX DG from Sigma for Nikon F-mount cameras and lenses. This model doubles the effective focal length while only losing 2 stops of light in the process. It also retains communication between the lens and camera, allowing users to use automatic metering and autofocus. Additionally, this teleconverter has a multi-layer coating that reduces flare and ghosting for sharp, clear imagery. 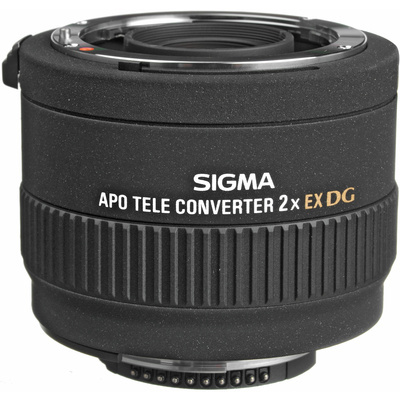 Note : Sigma APO Tele Converter 1.4x and 2x are dedicated teleconverter lenses. Due to the high optical quality of this teleconverter, this item will only fit and work with a select list of lenses. Please click here for a compatibility chart of all compatible lenses. The DG denotes added coating that achieves the best colour balance whilst cutting down on ghosting caused by reflections from the digital image sensor.